There are three basic types of handwarmers – Electronic handwarmers, Air activated and Supersaturated solution. Here is a brief guide courtesy of Wikipedia with additions from UKHAS. Air activated (iron). Air activated hand warmers contain cellulose, iron, water, activated carbon (evenly distributes heat), vermiculite (water reservoir) and salt (catalyst) and produce heat from the exothermic oxidation of iron when exposed to air. They typically emit heat for 1 to 10 hours. These emit water. Supersaturated solution (crystallization-type). Crystalisation types of hand warmer generate heat through the exothermic crystallisation of supersaturated solutions (typically sodium acetate) and are usually reusable. These can be recharged by immersing the hand-warmer in very hot water until the contents are uniformly fluid and then allowing it to cool. The release of heat is triggered by flexing a small metal disk in the pad, which generates nucleation centers that initiate crystallisation. Heat is required to dissolve the salt in its own water of crystallisation and it is this heat that is released when crystallisation is initiated. This type typically has a shorter heat duration of 20 minutes to 2 hours. Electronic hand warmers use use resistors to generate heat on an electric circuit. Electronic hand warmers are a clear alternative for backpackers and hikers but what about their suitability for HAB. 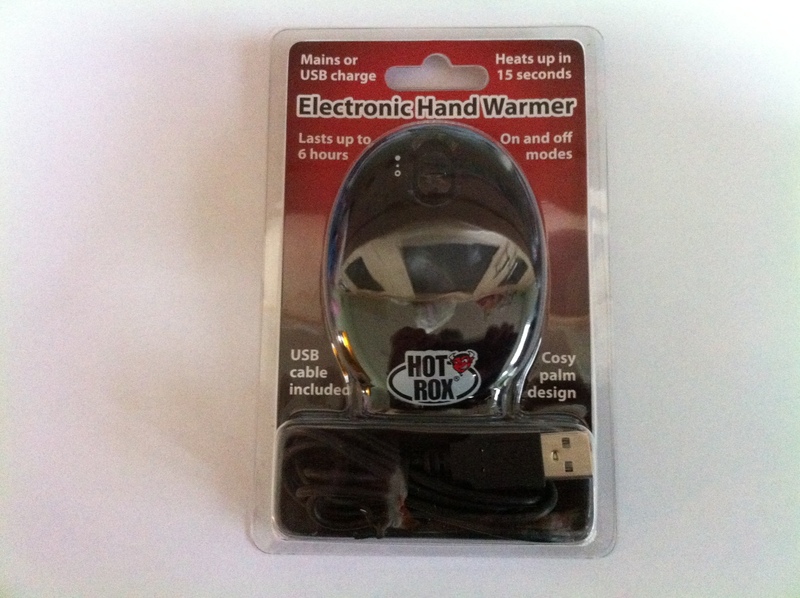 I tested out the Hotrox hand warmer and here is what I found. Both in size and weight they are suitable. HotRox is 60g and the approximate size of a credit card. The egg shape is somewhat of a disadvantage as it can’t be molded round a device. As for heat production, HotRox produces about half the heat of an air activated hand warmer at room temperature and pressure. However the performance of these is much reduced at altitude. 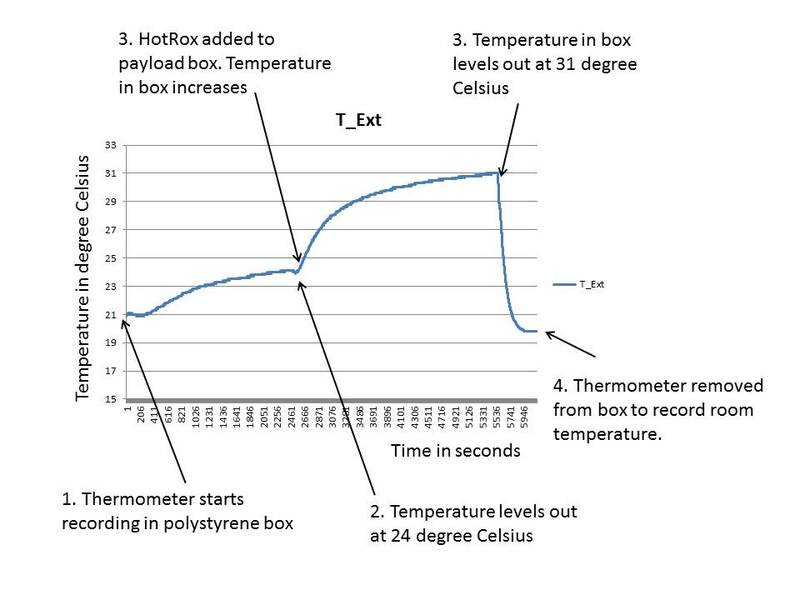 Below is a temperature graph created by the external sensor on a zlog flight computer for a trial in a polystyrene box. 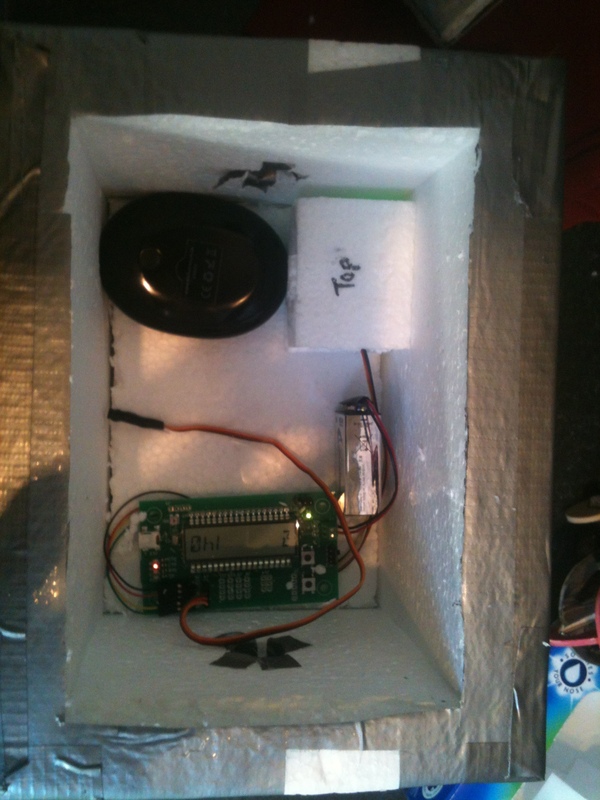 Initially the flight computer is on it’s own in the box and records the heat signal from the flight computer. The HotRox is then introduced which gives the box a 5 degree C temperature rise. This compares to 10 degrees for an air activated hand warmer at room temperature and pressure. Trials in near space will follow soon. During the test the box was sealed with a polystyrene lid.